If you want to visit the historic city of Santiago de Cuba but want to stay somewhere relaxing & peaceful within easy reach of Cuba’s second city, Hotel Rancho Club is good, inexpensive choice. Rancho Club hotel looks out on the city & mountains & provides a tranquil retreat from the bustling city, 10 minutes away by car. It is near enough to explore famous sites like Castillo de San Pedro de la Roca, yet far enough away to peacefully unwind in the sun on your return. Islazul Rancho Club is a 2 star hotel which is small & basic, with a rustic charm & blend of traditional & modern Cuban décor. The hotel has an open air buffet restaurant with beautiful views, although the service & food can best be described as hit & miss. However, the snack bar food is much better. 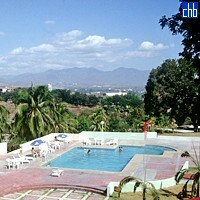 Rancho Club has limited facilities, though there is a pretty pool & terrace with a stunning backdrop. The hotel also has a shop (convenient, given the location), basic bar & nightclub. 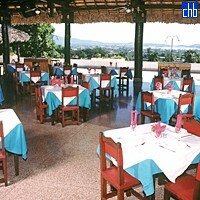 Rancho Club hotel is a cheap, basic but charming choice which should suit the needs of tourists wanting a relaxing break with easy access to Santiago de Cuba. 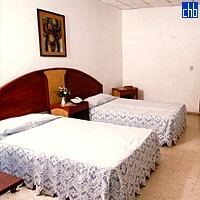 Rancho Club has 30 rooms which are clean & comfortable. All rooms are ensuite, with decent showers, air conditioning & satellite TV. The hotel’s rooms are of more than adequate standard for a 2 star hotel & some also have a fridge.